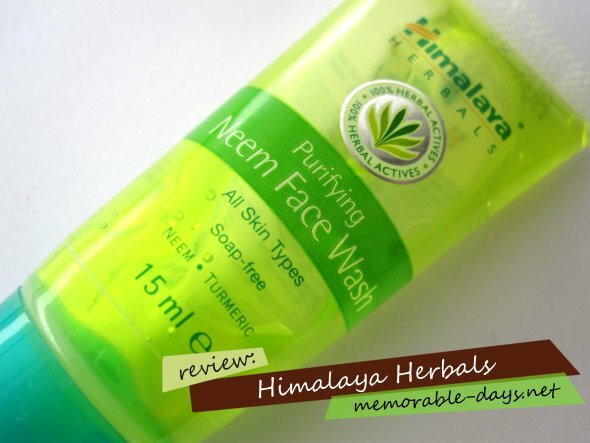 Review: Himalaya Herbals - Purifying Neem Face Wash | Memorable Days : Beauty Blog - Korean Beauty, European, American Product Reviews. I have tried the purifying neem face wash of the brand Himalaya Herbals for 2 weeks. I think that some of you have tried it as well, since you could get a free sample at "The Garden" (a Dutch store) the last time. Let me know what you think about this product ;). A gentle face wash that cleanses your skin by removing excess oil and impurities. Unlike soaps, the Purifying neem face wash doesn't leave the skin dry and feeling stretched. It's a soap-free herbal formulation that gently removes impurities and prevents pimples. It's enriched with Neem and Turmeric. Neem is well known for its antibacterial properties, kills problems causing bacteria. Tumeric effectively controls acne and pimples. You will have a clear, fresh and soft skin after usage. It's for all skin types. You can buy a tube (150 ml) for €6.63 online at their webshop and people in Holland can get it at The Garden for €4.60 or so. As you can see, it's not that expensive for so much product ;). It's a gel face wash that feels good on the skin and it doesn't foam (some people might not like that). The color of the product is yellow/greenish (cool color! lol.) and it slightly has a herbal scent which I like, it's a pleasant smell ^_^. Massage the gel gently over the face, wash it off and pat it dry. Use twice daily. Does it do what it promise? Hmmm.. it did clean my skin and I had the feeling that it had positive effects on my pimples. However, it also gave me a tight/stretched & dry feeling after usage =(. I have a combination/dry skin, so I prefer products that moisturizes my face. This product just didn't give me the moisturizing or soft feeling. I recommend this product for people with oily skin, not for a dry skin. It's overall an ok product for an affordable price. I do think that it prevents pimples and removes impurities. I also liked the light herbal scent and the color of the face wash, but I just didn't like the dry/stretched feeling after usage. It wasn't suitable for my combination/dry skin, so I wouldn't purchase this product in the future. Oeh nice :) Ik heb hiervoor in de plaats de Daily Gentle Exfoliating Wash ofzoiets. @Mei, jaa ik vind deze ook wel lekker ruiken ^^ !! @Silva, jup, ik denk wel dat het geschikt is voor mensen met een normale/vette huid.. als je maar geen droge hebt >.<"
I like how it looks like gel on your hand! Ooo! I don't really use a lot of skin moisturizing/cleansing products so hmm :-\ This product looks okay though, I would try it if I saw it in the supermarket hehe.